Congress held its first hearing on the Voting Rights Act today, as states rush to implement new voter suppression laws. The Senate Judiciary Committee held its first hearing today on the Voting Rights Act since the Supreme Court gutted the landmark civil rights law last month. 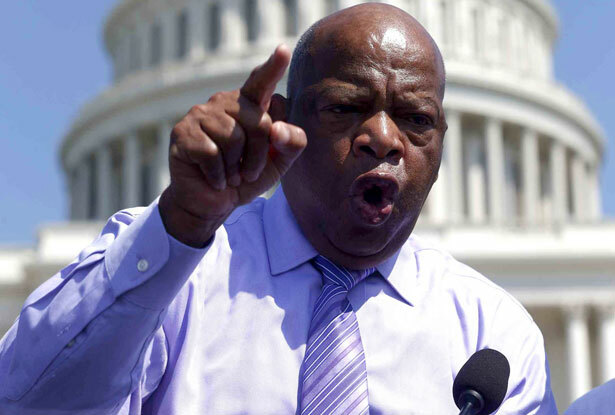 The key witnesses were civil rights icon Representative John Lewis and Representative James Sensenbrenner, the former chair of the House Judiciary Committee who led the effort to overwhelmingly reauthorize the VRA in 2006. His colleague Representative Sensenbrenner called the VRA the most important civil rights law of the twentieth century and said, “We cannot afford to lose it now.” The court’s decision presents Congress with a “historic opportunity” to draft a revised Section 4 of the VRA, he said, covering jurisdictions with “recent and egregious voting records.” Sensenbrenner mentioned that he proudly displays the pen Ronald Reagan used to sign the 1982 reauthorization of the VRA. “Though the Voting Rights Act has been enormously successful, we know our work is not complete,” he said. The key will be whether Sensenbrenner can bring fellow House Republicans along with him, like he did in 2006. “I’m certainly on board to put something together that will last for a long time,” he said. Tomorrow, the House Judiciary Committee Subcommittee on the Constitution will hold its first hearing on the VRA, which will give a good indication of where House Republicans stand on the issue. The subcommittee chairman, Representative Trent Franks of Arizona, was one of only thirty-three House Republicans to vote against the VRA’s reauthorization in 2006. Luz Urbáez Weinberg, a Republican city commissioner in Aventura, Florida, in Miami-Dade County, strongly disagreed with that argument. “Section 5 has no peer,” she said. “Section 2 is not sufficient.” Section 5 puts the burden of proof on targeted jurisdictions to show that their voting changes are not discriminatory before they go into effect, whereas Section 2 forces plaintiffs to show that a voting change is discriminatory, usually only after it has gone into effect, following lengthy, expensive litigation. It’s the difference between stopping a crime before it exists versus forcing the victim of the crime to seek justice afterward. So what can Congress do now? It can draft a revised Section 4 based on more current data. It can make it easier to “bail-in” states with recent voting violations under Section 3 (which MSNBC’s Adam Serwer called a “secret weapon”) and make it easier for voting rights groups and the DOJ to win Section 2 cases. Challenge new voting restrictions through preliminary injunctions and Section 2 of the VRA (which applies nationwide, but puts the onus on plaintiffs to prove that a law is discriminatory after enactment); pressure Congress to reconstruct the VRA; draft a new coverage formula for Section 4; and mobilize indignant voters to make their voices heard, starting with the fiftieth anniversary of the March on Washington on August 28. Simply looking at what’s happened since the Court’s decision—not to mention the four overwhelming reauthorizations of the VRA in 1970, 1975, 1982 and 2006—should give Congress ample evidence on which to act. It’s worth expanding on how disingenuous these claims are. As I noted above, neither Section 2 nor Section 3 come close to having the impact of Section 5. As election law expert Rick Hasen writes: “Section 2 is no substitute for section 5. It has virtually no teeth these days outside of the redistricting area…It has not been used successfully go to after voter id, and it would be hard to use it (given the statutory standard) to go after problems with voter registration and long lines. Even worse, if courts start reading section 2 more broadly to cover things like voter id, then section 2 itself could be found by the Roberts Court to be unconstitutional.” As Justice Kennedy said in 2009 (and seems to have forgotten in 2013), “Section 2 cases are very expensive. They are very long. They are very inefficient.” That’s why DOJ – which blocked discriminatory voting laws in places like Texas during the last election under Section 5 – hasn’t filed a single Section 2 lawsuit during the Obama administration. Moreover, states with recent voting violations can only be covered under Section 3 of the VRA if plaintiffs show that voting changes were enacted with intentional discrimination, which is almost impossible to prove. Congress could amend Section 3 so that plaintiffs only have to prove the effect of discrimination to win a case, but absent that, Section 3 will remain a little-used remedy. Section 5 is so important because, as Bob Kengle of the Lawyers’ Committee for Civil Rights noted, “racial discrimination in voting needs to be stopped before it occurs.” Spencer Overton of George Washington University Law School likened it to the metal detector he passed through before testifying today in the House. Rep. Sensenbrenner is still the only high-profile Republicans to argue that Section 5 remains vital. The rest of the GOP seems to be reciting talking points from the Heritage Foundation. Unless a tremendous amount of pressure is brought upon Congress to resurrect Section 4 or to strengthen the other parts of the VRA – starting during the August recess – chances for VRA reform look pretty slim.